on the third 1931 trip of the LZ-127 Graf Zeppelin. The LZ-127 left Friedrichshafen on October 17 and returned on October 28. 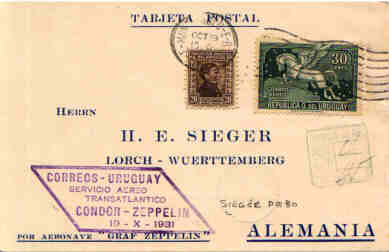 The machine postmark is unreadable although a Sieger book might identify it. The card also has the CONDOR - ZEPPELIN parallelogram. I can't make out the other marking under the Pegasus. and the 20c 1928 olive brown Artigas (Scott 366).